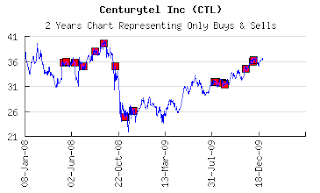 CenturyTel, Inc., together with its subsidiaries, is an integrated communications company engaged primarily in providing an array of communications services, including local and long distance voice, Internet access and broadband services. The Company operates in 25 states located within the continental United States. is currently sporting an 8% dividend. CenturyLink is a dividend aristocrat. is soon to be a member of the fortune 500. Use great service and an preexisting relationship as a means of turning their existing phone customers into package consumers of phone, high speed internet, and television services. Building a substantial backbone network to support data traffic allowing them to profit by delivering an end to end solution to customers. Use the revenues from phone to build a warchests that has been used to purchase companies in vulnerable positions. P/E is solid as is price to book, EPS is low, Current is likely low as a result of most recent acquisition. has over the last ten years kept a historically high cash position. historically has kept both short term and long term debt consistent and under control. Accounts payable average 1.6% of total liabilities and equity. Total Liabilities have decreased year on year in 6 of the previous 10 years showing an conservative approach to management. There has been an active stock buyback indicating a concern for shareholder equity. COGS is decreasing as an overall percentage indicating a push towards cost savings and systematic improvements. Gross Profit has increased as an overall percentage of revenue. Balance sheet is heavy with intangibles. Other long Term liabilities have steadily grown. Net income has decreased year on year in 6 of the previous 10. Healthy insider trading can indicate the executive's belief in the health of the business and can indicate an undervalued stock. In this case we see nothing but a history of selling, it appears that as soon as any of the exec get bonus stock they sell shortly there after. CTL is well regarded in the industry receiving a number of awards for customer service and satisfaction. CTL makes an effort to be socially aware at the local level involving itself in community fund raising, food drives and a united way partner program. All of this ultimately helps to increase its perception as a local business. This company is not going to bust out and show massive stock appreciation. Based on some fundementals and a good story it may be undervalued. Simply put I expect that over the course of the next few years CTL will continue to grow its TV and internet business and with an ongoing focus on its shareholders will continue to pay a solid dividend. At the time of writing stock has not yet been purchased in this business.